The constitution writing process is stuck in the debate of state restructuring. The Committee on State Restructuring and Sharing of State Power has proposed 14 ethnicity based provinces - its opponents argue this will provoke civil war. Ethnicity based provinces seem to be the idea of foreign experts. The UNDP's Human Development Index 2009 has analysed our social diversity from an ethnic perspective. This could be seen as a strategy to fuel ethnic conflict in a country situated between the two emerging super powers, India and China, and drag them into regional conflict. But if it is aimed at bringing ethnic groups into the mainstream of development, one has to look at other social aspects and possible consequences. Our political leaders think state restructuring is as easy as drawing a map on a paper sheet. They seem unconcerned about other aspects of society and are bargaining hard for their own gain. There are various aspects of federalism that must be taken into account: physical, institutional infrastructure and human resources. We have to have resources to study this. Nepali politics is infested with personal and party interests. The prolonged transition of the country has made government institutions incompetent. If political parties are considering developing a new structure with donor support, it will not change the situation. Developing a mechanism alone is not sufficient. Take the failure of the Decentralisation Act 2000. Nepal is unique for its physical, social and cultural diversity, and its intertwined nature. By ignoring the existing social fabric, we risk destabilising communal harmony and relations. For instance, Tarai lands are turning into desert, and can be protected only if we save the Chure areas. It should be noted here that there have not been open discussions on restructuring the state. It indicates the parties must have ulterior motives, which is an ominous sign. Take One Madhes Prades. The proposal must have been made with political aims in mind, since making a single province from Jhapa to Kanchanpur is impractical. The question is: what has compelled us to restructure the state when there is so much investment and risk involved? Past efforts have been misinterpreted. Not all the policies were faulty. They failed to yield results as they were never implemented due to feudal characteristics and a corrupt mentality. Therefore, it would be wise to make reforms in the existing structure, which can bring about a stable government and economic development. In that case, the development regions could be developed as provinces, and constituencies could become village assemblies and municipalities. Ethnic representation can be ensured even in village assemblies. Village assemblies could be entrusted with responsibilities to plan and implement programs for localities. District Development Committees could be transformed into district assemblies, which could act as intermediaries between village and provincial assemblies, the latter representing development regions. This would be much easier than completely restructuring the state, as the necessary infrastructural and institutional development is already there. Assembly members would be elected from constituencies. 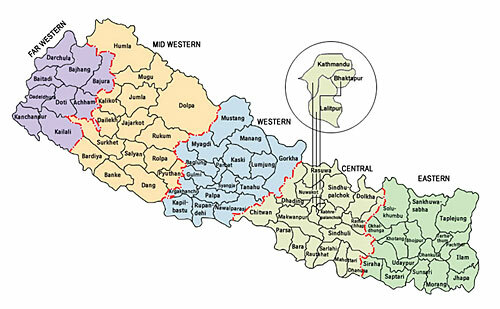 These regions are divided north to south connecting the Himal, hills and Tarai. This will keep the geo-physical balance of the provinces intact. The provincial assemblies would be free to make policies for their provinces but they would take decisions on natural resources in coordination with the central government. We know the existing structure actually works. We have knowledge about the existing institutional and physical structure. We know the strengths and weaknesses of these regions. However, political consensus is a must for the transformation of existing development regions into provinces. This would significantly reduce the cost of federal administration as well as the social, political and economic risks involved in the new federal model. I don't understand why can't there be just three states, Himal, Pahad and Terai and a center. There is enough diversity, resources for development and potential for growth. Ethenic based rubbish of Maoist is for killing time and nothing else. Maoist are full of Bahuns, expecting anything from them is a bigger rubbish.